GROM Firmware Here you can download the latest version of firmware for your GROM-BT3 interface. Here you can download the latest version of firmware for your GROM-BT3 adapter. All GROM kits are shipped with the latest available firmware. Please DO NOT update the firmware unless you were instructed to do so by one of our tech specialists. LED will blink and stay solid. Update complete! Make sure the microSD card you are using is formatted FAT file system structure i.e. FAT32, FAT16 or FAT. 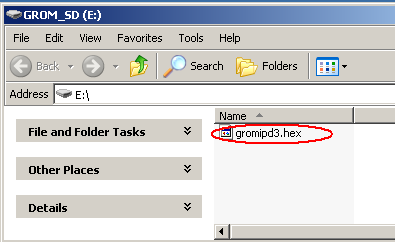 /// NTFS and exFAT are not supported by the GROM.